You would think this would be a obnoxious soup, but the garlic becomes almost undefinable and just an exquisite aroma. Drop garlic cloves in boiling water and boil 30 seconds. Drain, run cold water over them, and peel. Beat the egg yolks in the soup tureen for a minute until they are thick and sticky. Drop by drop, beat in the olive oil as for making mayonnaise. 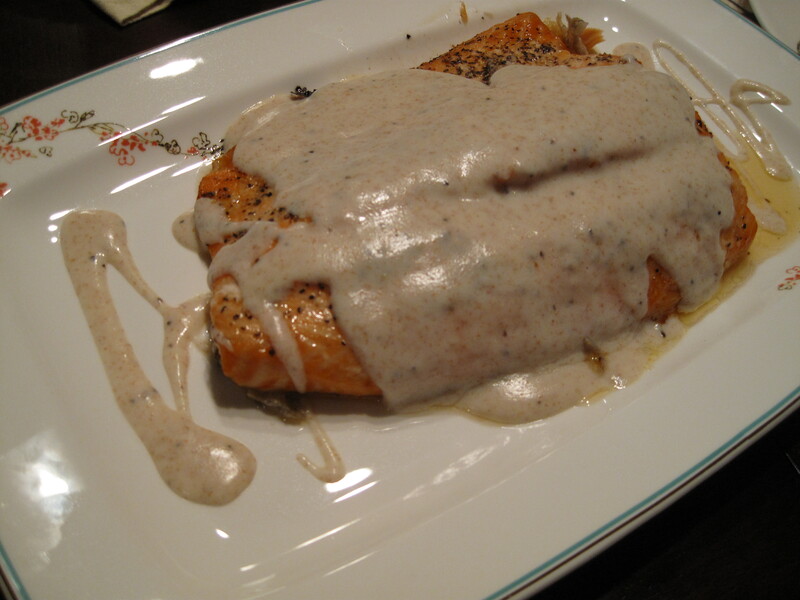 Served this sauce enriched with beurre (butter) over a thick salmon baked in herbs, olive oil and a hint of lemon. Remove roux from heat. As soon as roux has stopped bubbling, pour in all the hot liquid at once. Immediately beat vigorously with wire whip to blend liquid and roux, gathering in all bits of roux from the inside edges of the pan. Set saucepan over moderately high heat and stir with the wire whip until the sauce comes to the boil. Noil for 1 minute, stirring. Remove from heat, and beat in salt and pepper to taste. Sauce os now ready for final flavorings or additions. 1-8 Tb Butter – Just before serving the sauce, and after all the final flavorings have been added, remove it from heat. Stir in the butter, a half-tablespoon at a time, beating until each piece of butter has been absorbed into the sauce before adding the next. Spoon the sauce over the hot food, or pour the sauce into a warmed bowl, and serve immediately. Today I was convinced that following a [French] recipe to the “T” is of utmost importance. I did not shortcut on time for simmering or cooking, nor did I shortcut color on browning. The result: a deep, rich flavor characterizing a perfect brew! 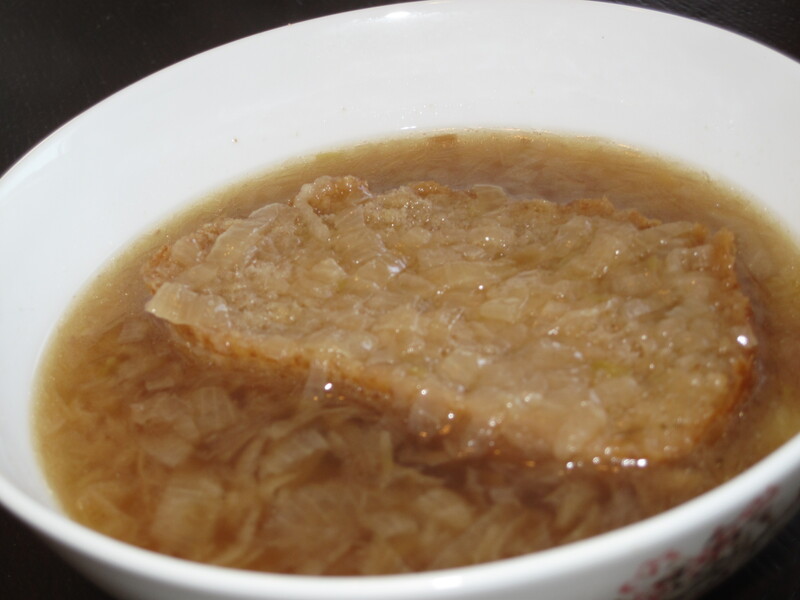 The Key to Developing an Excellent Onion Soup: Long, slow cooking in butter and oil, then a long, slow simmering in stock. Uncover, raise heat to moderate, and stir in the salt and sugar. Cook for 30-40 minutes stirring frequently, until the onions have turned an even deep, golden brown. (*) [At this point you may] Set aside uncovered until ready to serve. Then reheat to a simmer. Just before serving, stir in the cognac. Pour into a soup tureen or soup cups over the rounds of bread and pass the cheese separately. When a recipe calls for dry white wine, what do you normally use? I have been cooking with cooking wines for years and occasionally with the real deal, but until faced with French cooking, I never bothered to question the difference. Welp, apparently my trusty cooking wines are quite frowned upon in the world of chefs, ha! I stumbled upon this site chowhound.chow.com and found suggestions and recommendations from fellow cooking lovers. New to using REAL wine while cooking, I welcome comments from your personal experiences! Have you had better success with a particular white wine? I am still suffering from a broken tailbone, so now I just need to call on a willing friend to bring me a bottle for my next recipe attempt tonight. I attempted the Reine De Saba (Chocolate and Almond Cake) and my favorite part was pulverizing the almonds. Tip…use a tablespoon of sugar per cup of almonds so that they wont become oily and unusable when pulverizing. The part that was most gratifying was soft peaks and hard peaks on those egg whites. It felt much like a milestone for a novice. I had to use a 9″ round cake pan though the recipe called for an 8″ round. My failure…I forgot to consider the heat dispersion and thereby reduce the time, so I cooked the cake all the way through (It was supposed to remain slightly undone in the center to create a creamy texture). My save…I perfected the Glacage au Chocolate (chocolate icing) and it wrapped the cake with aesthetic decadence. Save. This was not the most amazing chocolate cake, but it was extremely good. Maybe I’ll get it right next time with the creamy quality. I prepared this ahead of time and added butter and minced herbs just before serving. You can use a pressure cooker (15lbs for 5 minutes, release, simmer uncovered for 15 minutes), but I made mine on the stove using a 4-quart sauce pan. Mash the vegetables in the soup with a fork, or pass the soup through a food mill. Correct seasoning. (*) At this point you may set aside uncovered until just before serving, the reheat to the simmer. If you’ve tried this, would love to hear your thoughts or personal variations!